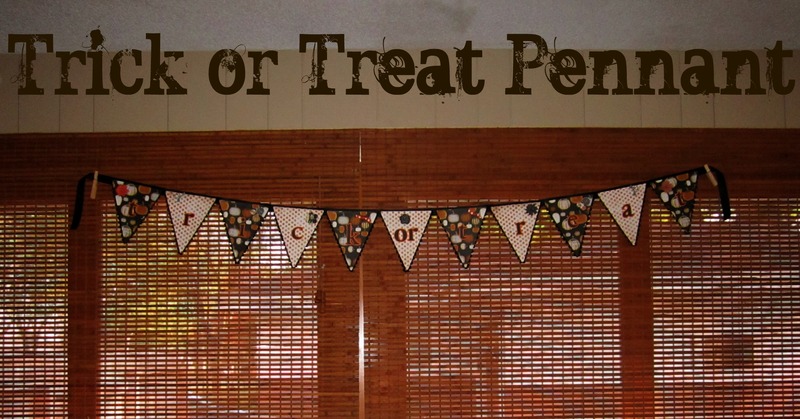 I came across this cute little project from an e-mail I received that linked to different blogs featuring Halloween crafts. I fell in love with this project and just had to make it. 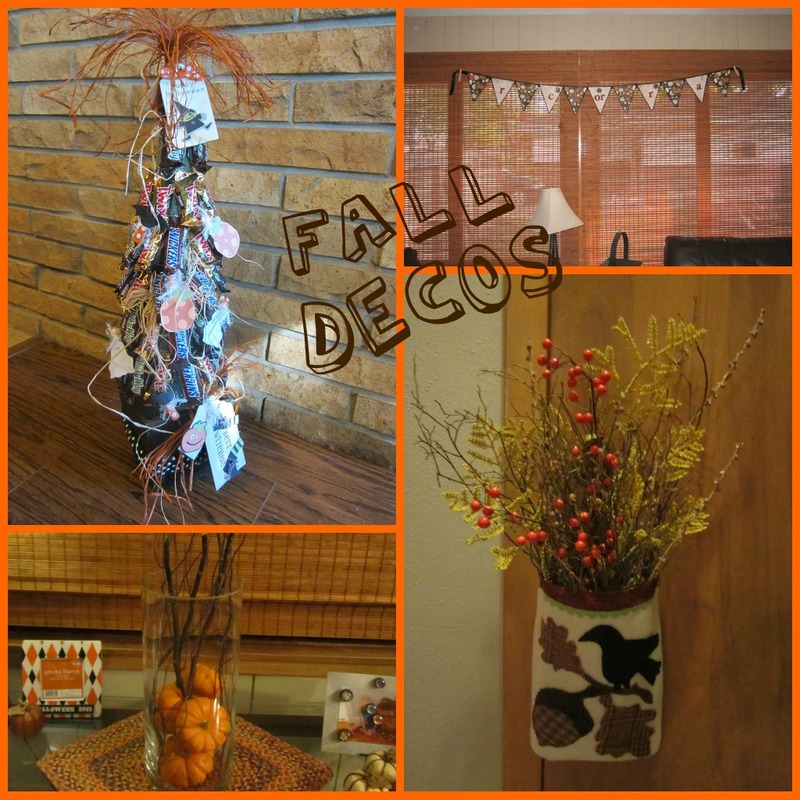 If you are craving some new fall decos and don’t have a lot of time, this project is for you! It is very simple and fast! The original idea came from Chicken Scratch. Visit this site to see another style of this garland. I cut 6 pumpkin shapes (about 5 1/2″) from the Doodlecharms cartridge on my Cricut. Next, using the patterned paper I cut 6 oval shapes from the George Basic Shapes cartridge (about 5 1/2″). 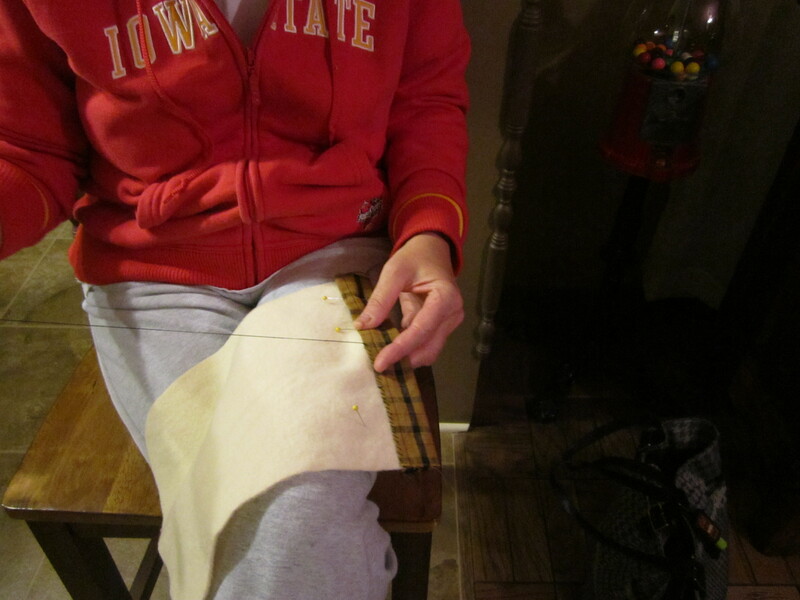 To make the stem I just traced that part of the pumpkin shape onto brown cardstock. Prior to putting the pieces together, I used the dark brown chalk to chalk the edges of each piece for a more rustic look. 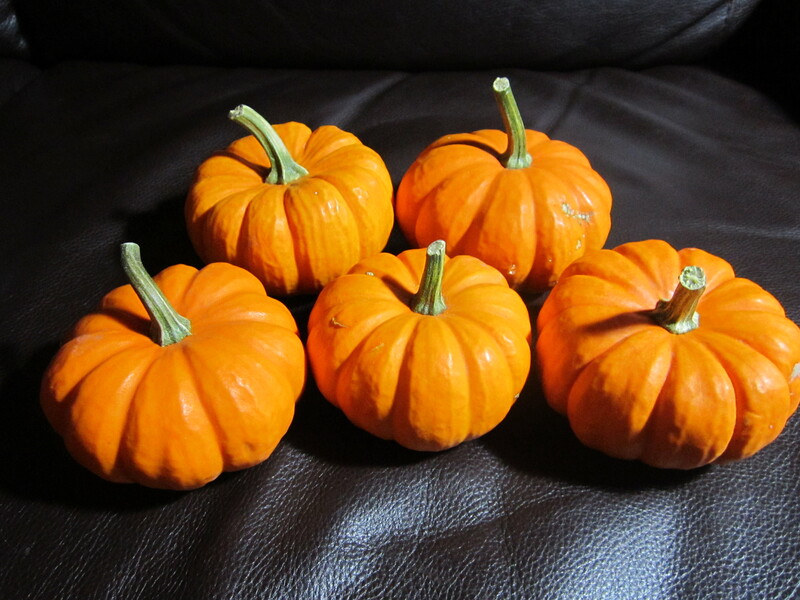 To construct the pumpkins I glued the brown stem to each pumpkin shape. 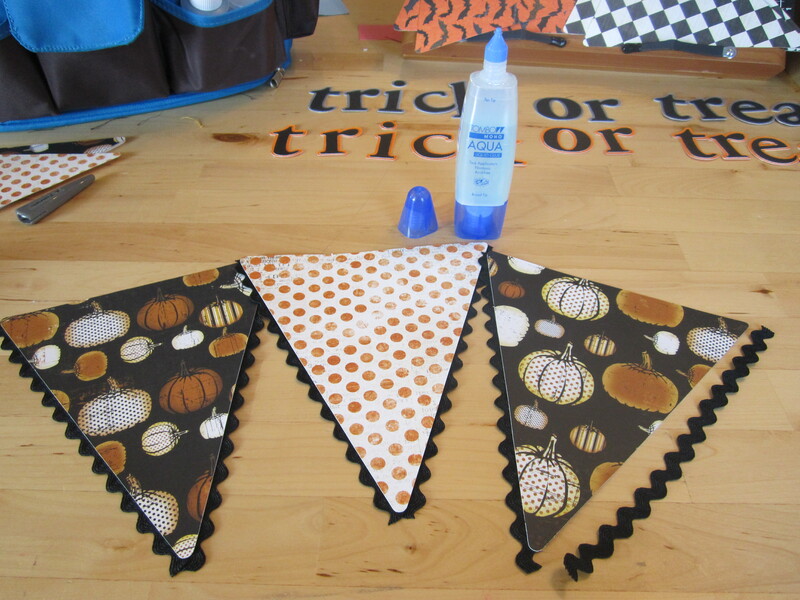 Next, I used 4 pop dots to attach the oval piece in the center of each pumpkin. I like how it gave the pumpkins a little dimension. To hang the garland I used a hole punch to make two holes on the sides of each pumpkin. Next, I strung the jute twine through the holes. Last, I hung it up on my fireplace mantel. Easy and so festive! I just love fall! I love the weather, the colors and traditions it brings. This year I’ve been busy putting together some new crafts to decorate the house for fall and Halloween. Here are a few of the things I’ve been up to. 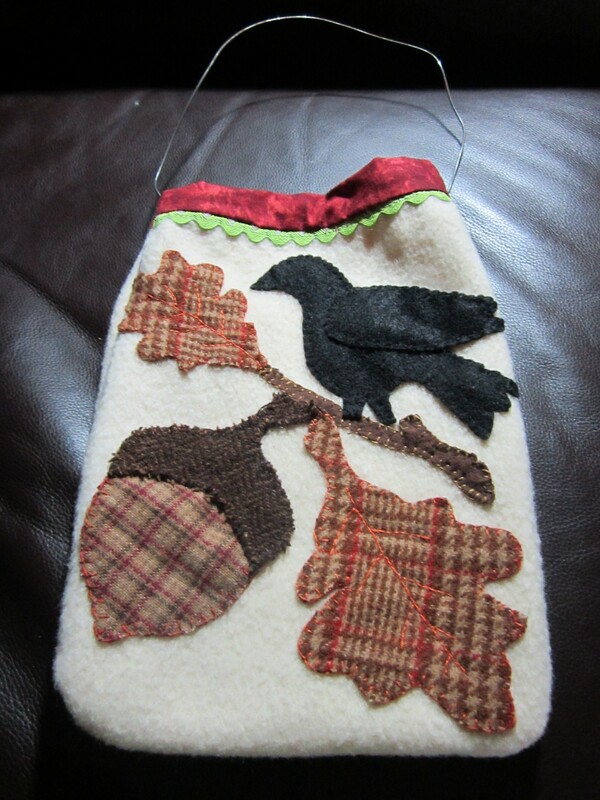 First, I made this fall felt pocket and filled it with fall leaves, sticks and berries. A few weeks ago my mother-in-law and her sister invited me over for craft night. 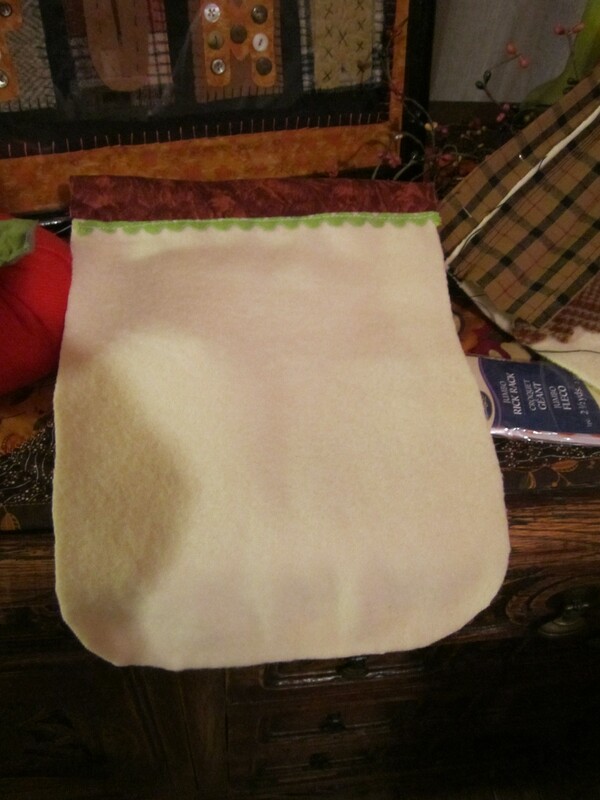 They taught me how to work with felt and wool to make this cute pocket. We worked on dividing and conquering the project. Pam cut the pocket forms, Nancy sewed them up and I cut the pieces you see on the front. Everyone did their own stitching. Each piece was stitched on the pocket using a blanket stitch with embroidery thread. I was instantly hooked on this craft! It was a lot of fun and so quick. I mostly enjoyed the company of Pam and Nancy! Last, Pam added a wire to the top of the pocket so it could be hung up. 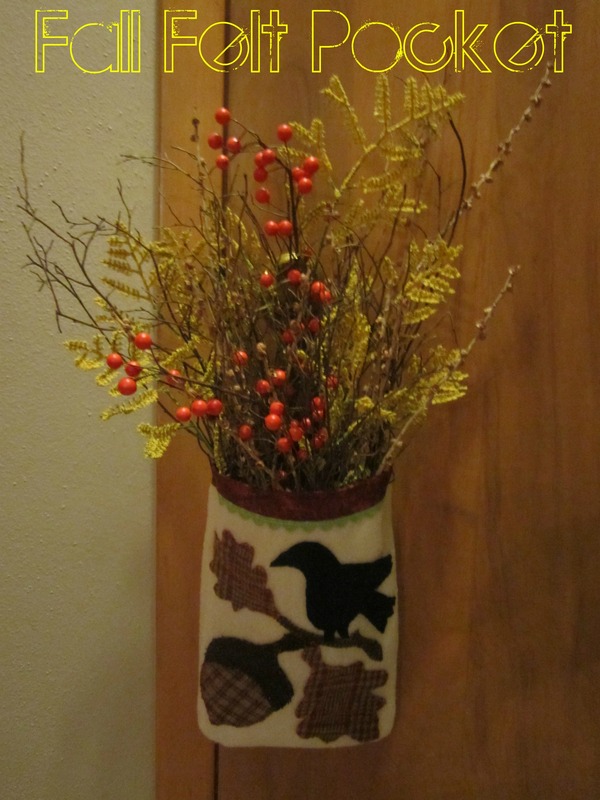 The next decorating idea I found on Pintrest. 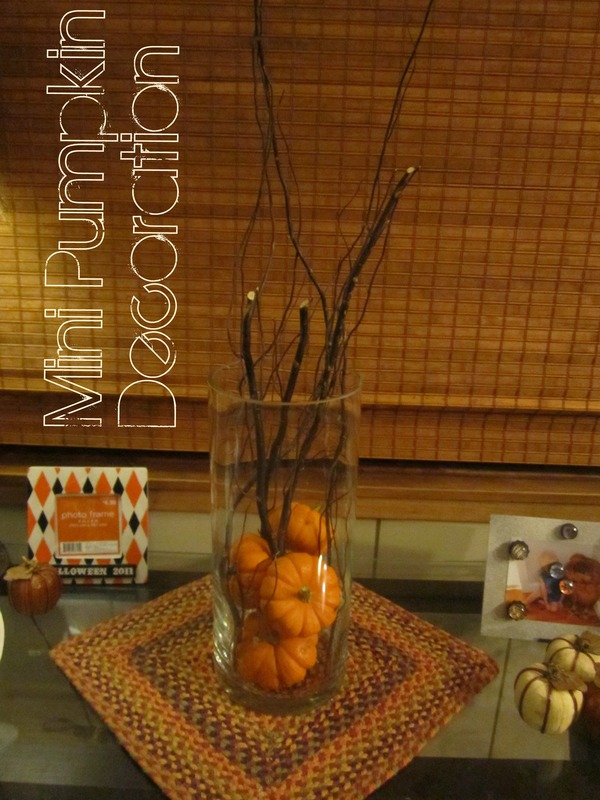 I love the simplicity of this mini pumpkin decoration. I took advantage of the sales at Hobby Lobby one week and bought all the supplies (except the pumpkins – I got those at Hy-Vee). 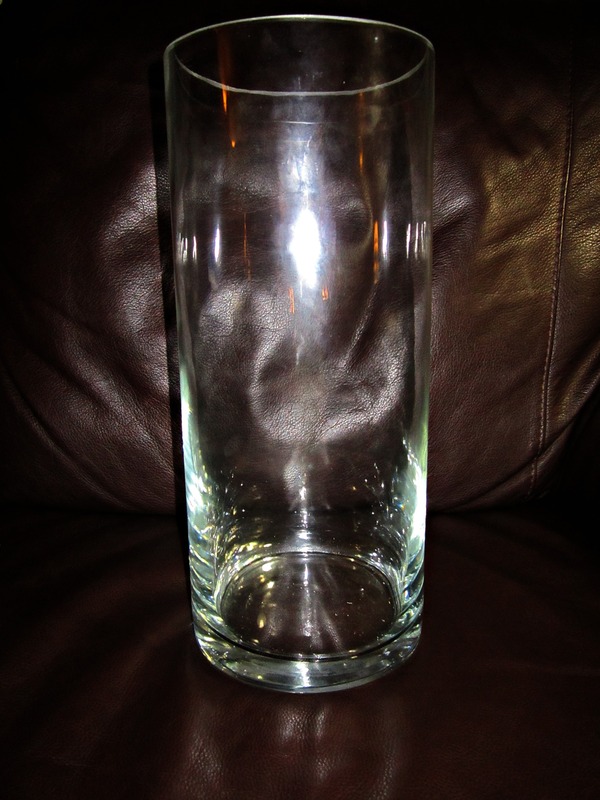 I started with a tall, clear vase. 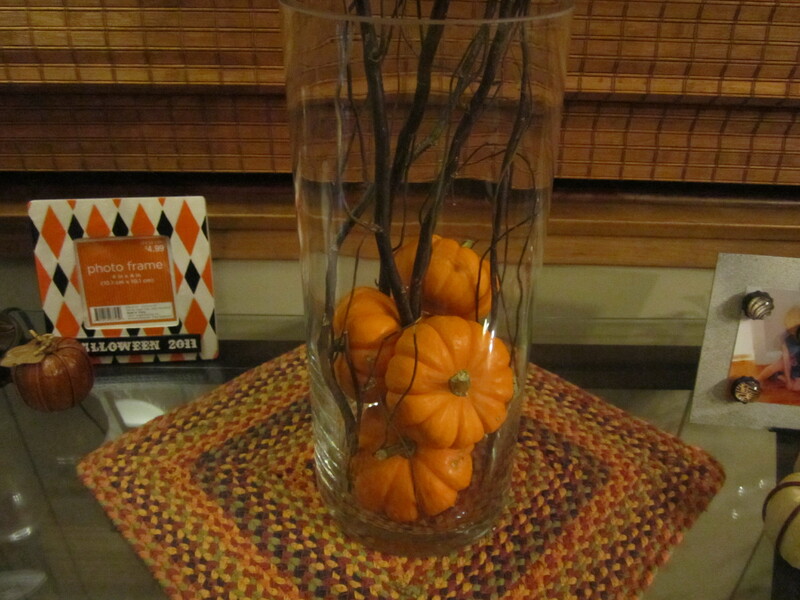 I arranged these stick things in the vase between the pumpkins. I found this idea last year in the Hobby Lobby magazine they always tempt me with at the checkout. 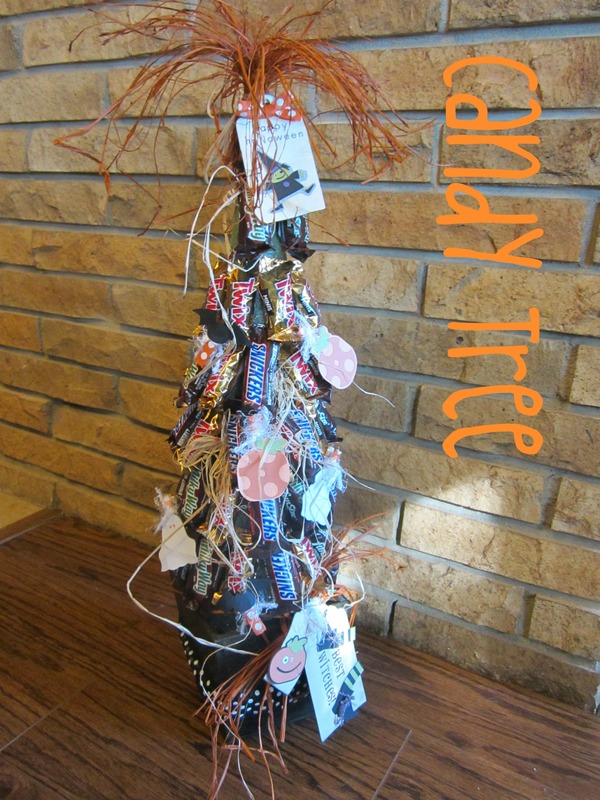 I just had to make the candy tree again this year for Halloween and who doesn’t like chocolate? It was much quicker this year since I kept all the supplies and just had to attach the candy. 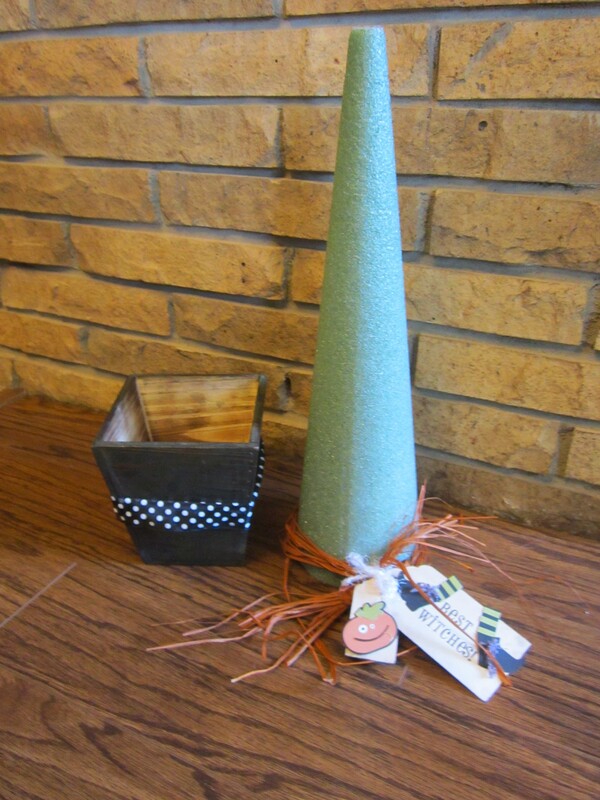 For the candy tree you will need a planter or vase to place the styrofoam cone in. I also decorated the planter with black ribbon with white polka dots. Around the base of the cone I tied orange raffia and the cute tags I created using the “Mini Monsters” Circut cartridge. 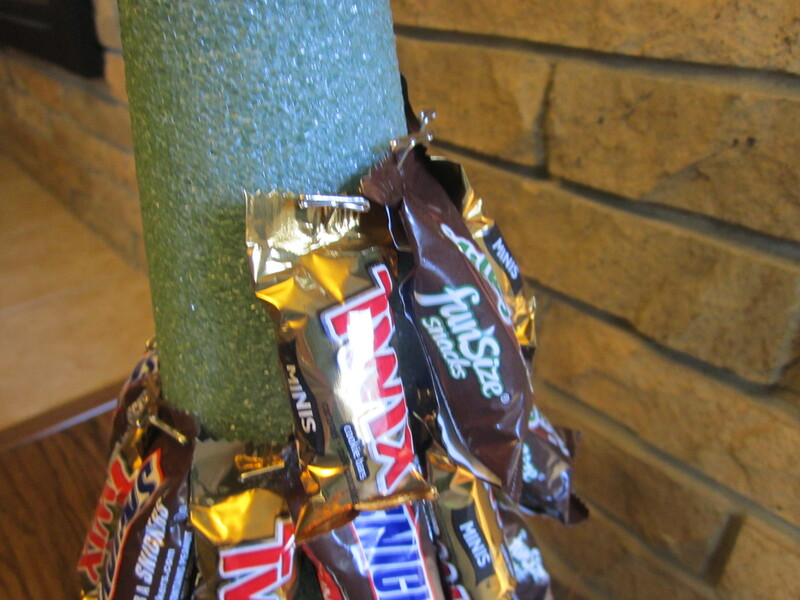 Place the cone in the planter and you are ready to attach the candy bars. 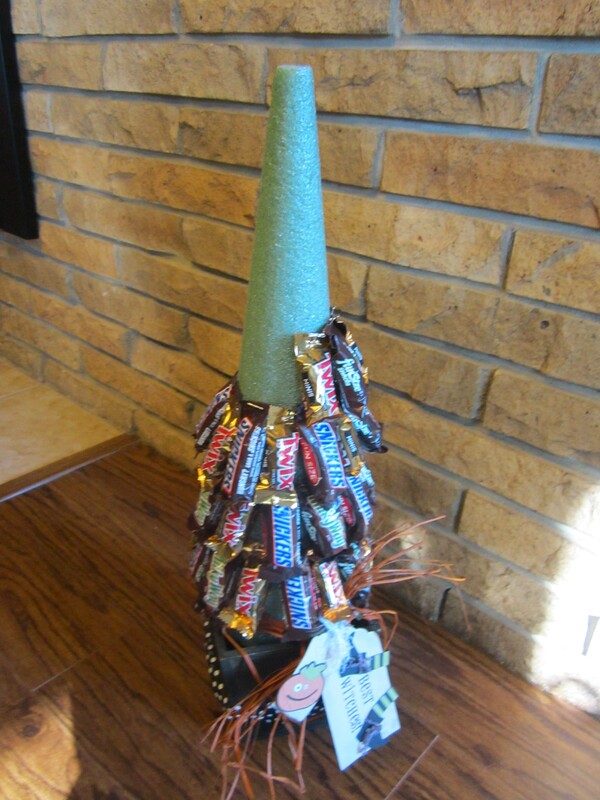 Using pins (I found T-pins work really well) attach the candy bars around the cone. Overlap them so most of the green cone is hidden. I bought a bag of 50 fun size candy bars and was just a couple short when I got to the top. (Shhh: I just left the back spots open where it wouldn’t show). I bought the larger sized cone, but my mother-in-law made the same tree from the smaller sized cone so that works, too. For the finishing touches I added more cut out Halloween shapes (pumpkins, bats and ghosts) that I cut out from the “Mini Monsters” Cricut cartridge. I glued a mini-clothespin to each shape to make it easy to attach to the candy on the tree. On the top I made a clump/spray of orange raffia with another tag. 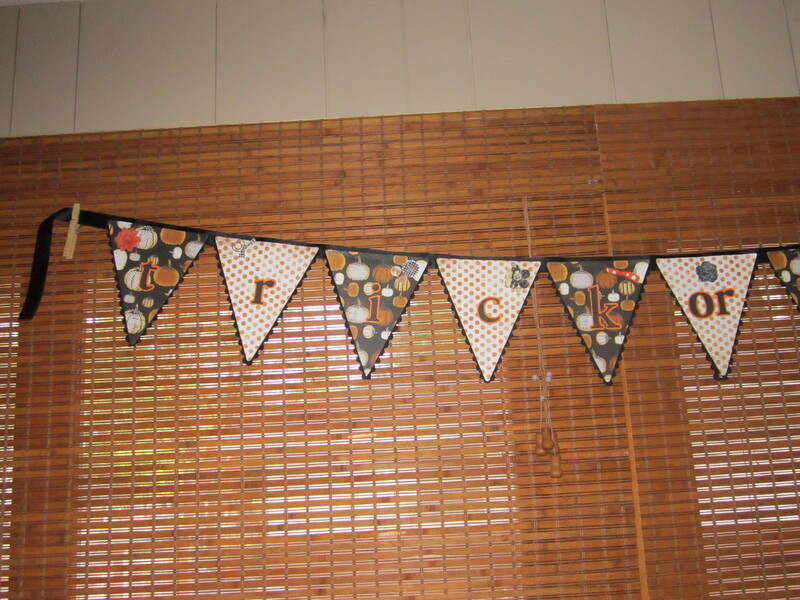 I’ve been wanting to make one of these pennants for quite a while since you see them everywhere these days. I found my inspiration for this project in the Pottery Barn Kids catalog. Their pennant was made of fabric, but I decided I’d use paper. 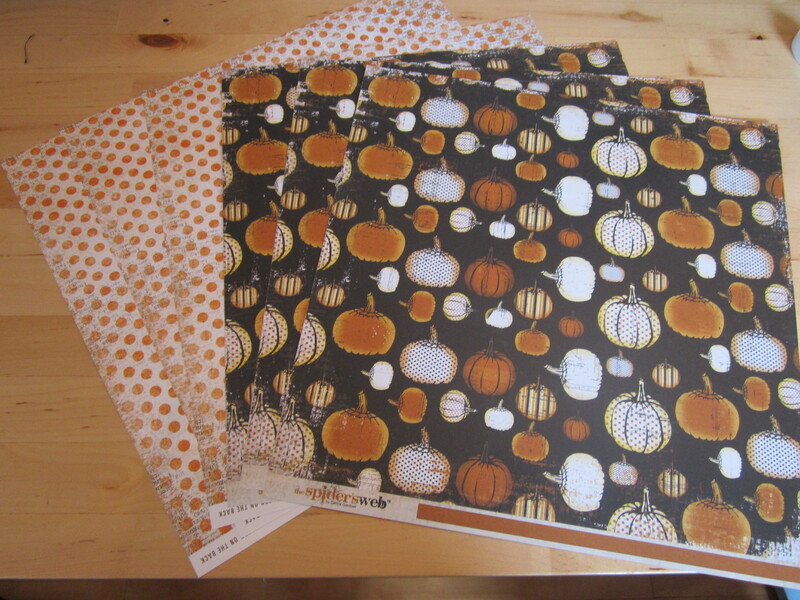 I started with 6 pieces of adorable Halloween scrapbook paper. I found these cute patterns at a little scrapbook store in Watertown, SD that we always visit (and donate a lot of money to) on our way to our annual scrapbooking retreat. 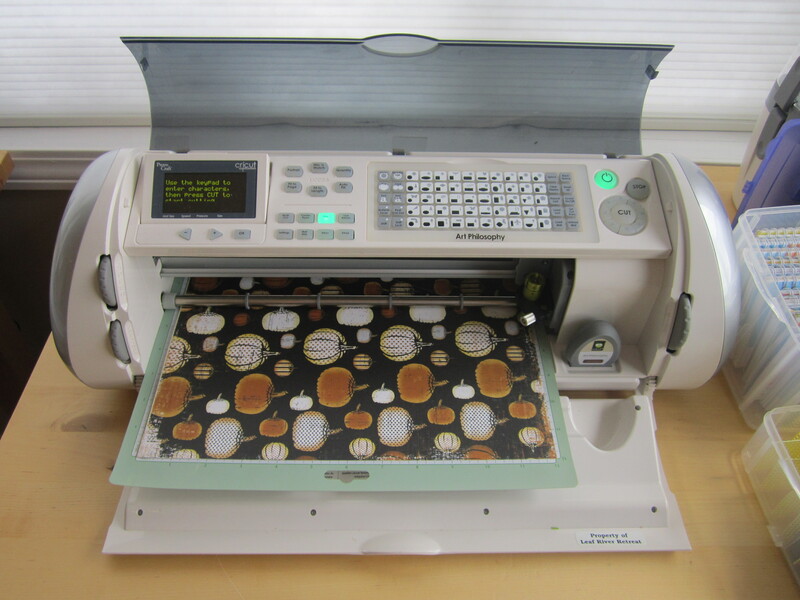 Using the “Art Philosophy” Close to my Heart Cricut cartridge I cut eleven 7″ triangles in alternating paper patterns. our scrapbooking retreat and used other fun papers. 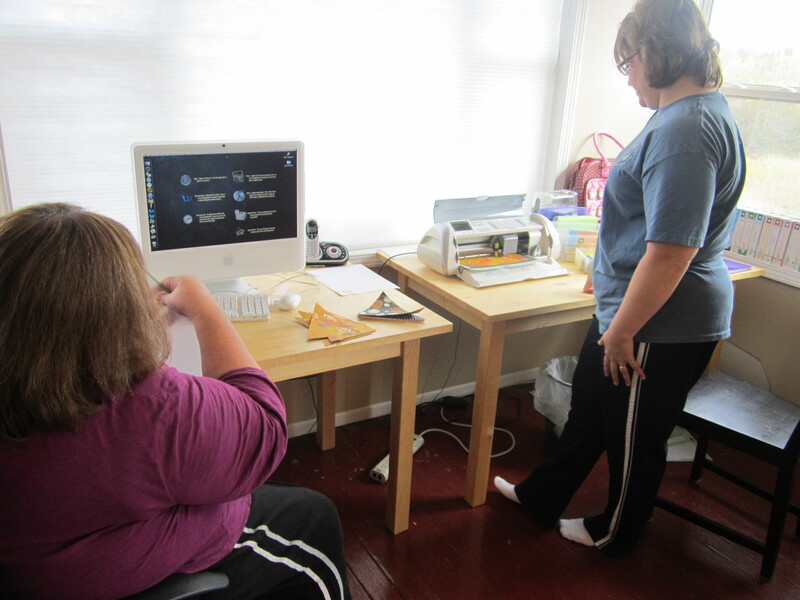 Here are Kellie and Andrea using teamwork to cut out their triangles! 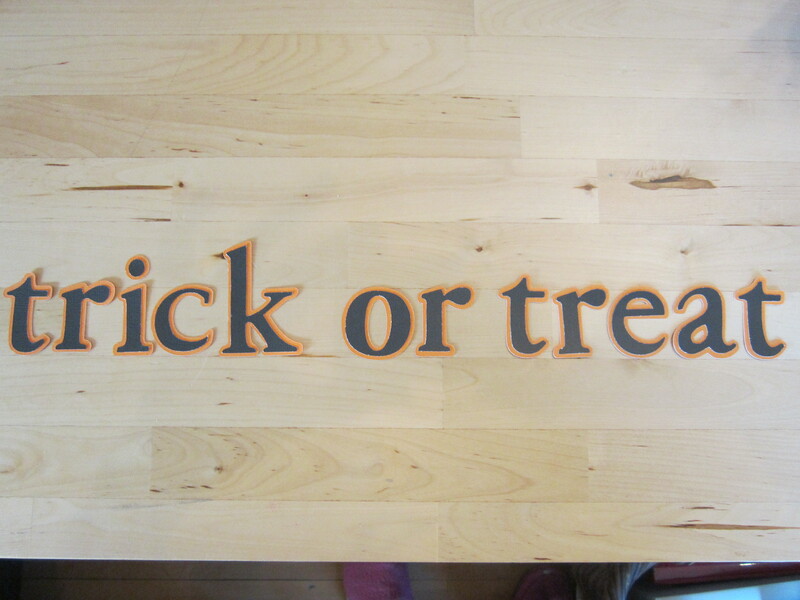 Next, I cut out the letters to spell “trick or treat” using the “Plantin’ Schoolbook” Cricut cartridge. I used orange for the shadow and black for the letter. So thankful for whoever invented the Cricut machine to cut these letters and whoever made the Xyron sticker making machine to adhere these tiny letters! The most tedious part of this project was gluing black rick rack to the sides of each pennant. I used Tombow glue and lots of patience. 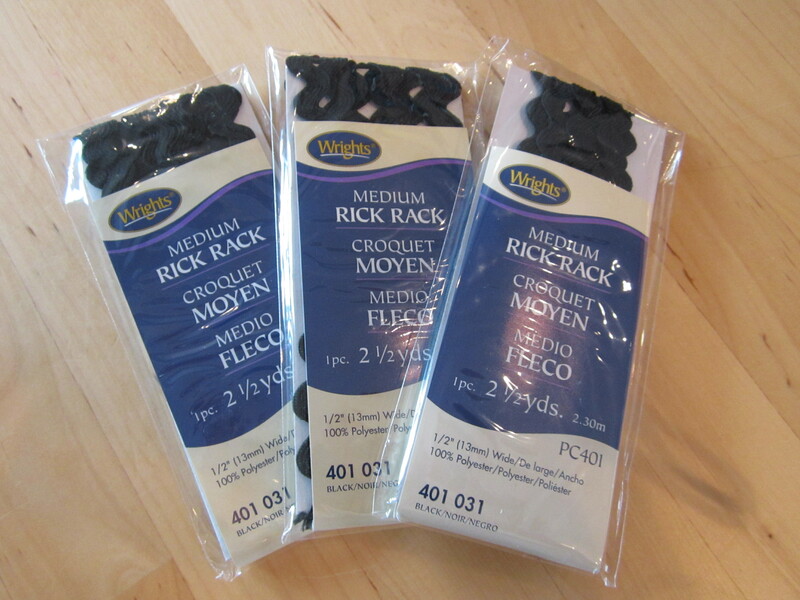 It took two packages (5 yards) of medium-sized rick rack. 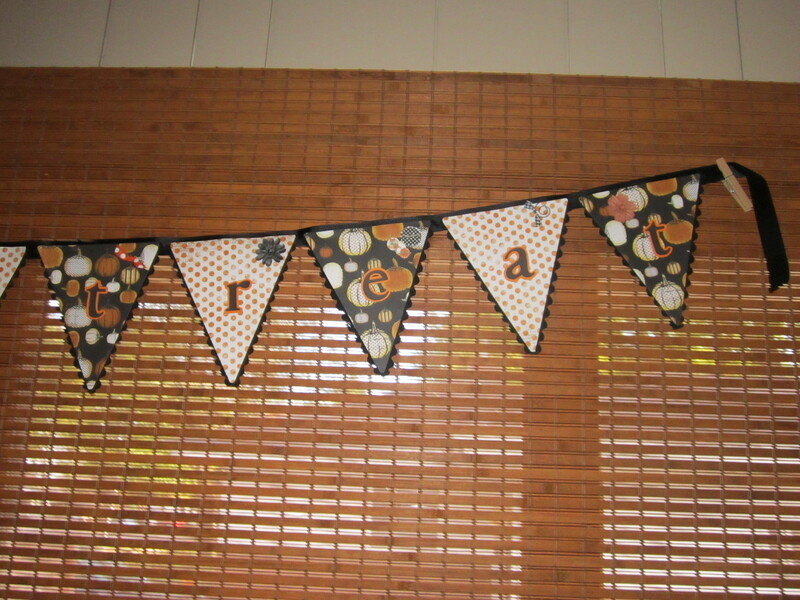 I added one letter to each pennant (except “or” was on one). 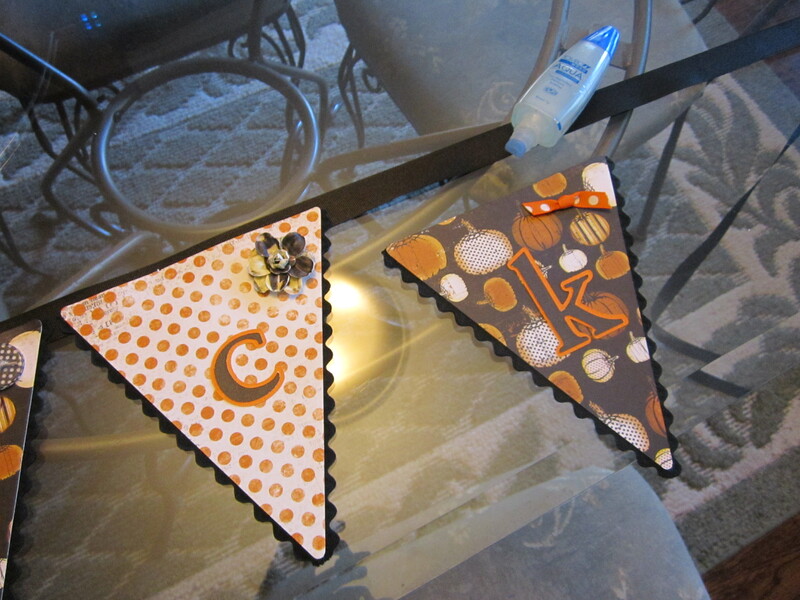 To jazz it up I added a few embellishments (flowers, clips, ribbon) to each pennant. Last, I glued all the pieces to a length of black ribbon. 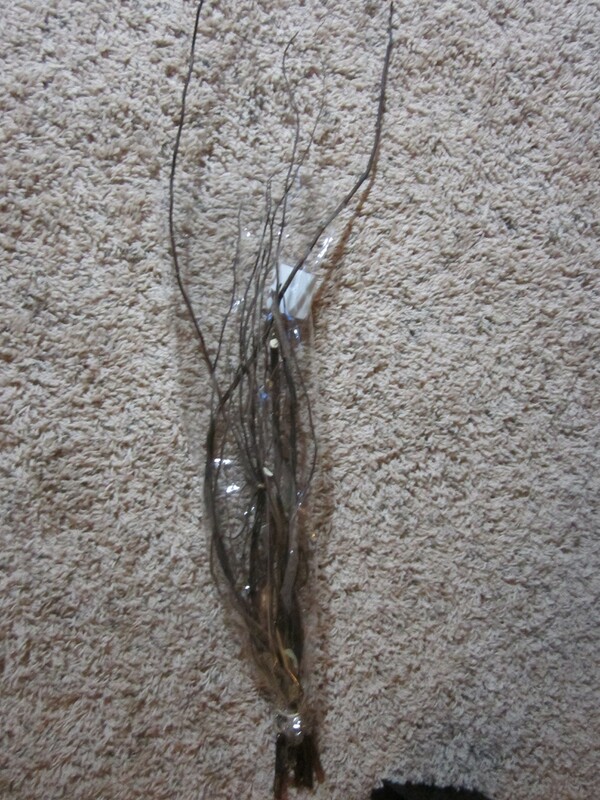 I was sure to leave a tail of ribbon at each end to hang it. I wasn’t sure how to hang it up, but ended up using clothes pins attached to our shades. If I get time I may try to jazz up the clothes pins. We have this huge window in our living room, which ended up being the perfect spot to string a pennant.